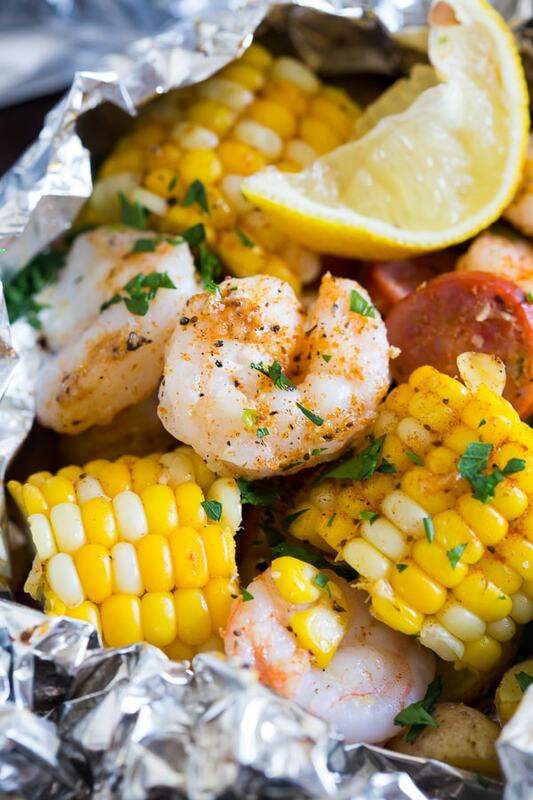 These low country boil foil packets are a breeze to make and packed full of flavor. Potatoes, corn, andouille sausage and shrimp all together in an easy foil packet that you can bake in the oven or throw on the grill. 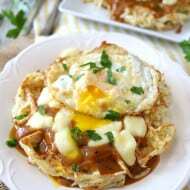 You’ll love this flavorful dish! Every time I make a foil packet meal I think of camping. Which, for the record, I hate. I’m really not meant to sleep on the ground. As a kid, I used to camp all the time with my high school best friend because her parents owned an old fashioned reenactment business and I would tag along. I know you’re probably thinking to yourself “what in the heck is an old fashioned reenactment business? !” Well, I’m happy to explain. You know when you see local events that reenact war battles and what not? Her parents owned a store that sold 18th-century reproductions of clothing, goods, guns, etc. It’s so random to try and explain this BUT it was a big part of my weird teenage years. Now, when you stay at these events (they usually are over the course of a weekend) you have to camp out in period friendly tents. So I quickly learned how to set up a canvas tent and learned to try and love the whole “sleeping in the great outdoors.” Luckily for me, they had cots so at least I wasn’t on the ground. I don’t do the ground. I don’t even do the floor of a house. I’m too old to sleep on the floor. It’s a rule I like to live by. For real, once I went to a friend’s house and the were all “you can sleep on the floor” and I was like “I don’t think so. I’ll stay in the nearest hotel.” Am I high maintenance? I like to think no, but if you try to make me sleep on the floor (or outdoors) we will have problems. Ok, now that you know I spent a weird amount of my time dressed up in French peasant clothing (because her parents did French and Indian war reenactments) it’s time to talk about the food. Yes, sometimes we went out to dinner BUT sometimes we did the whole “cook by the fireside thing.” Now, we never had packets like this BUT we did roast potatoes so that’s like almost the same thing – right? Ok, not really. BUT I had to figure out some way to get back on track with this story. 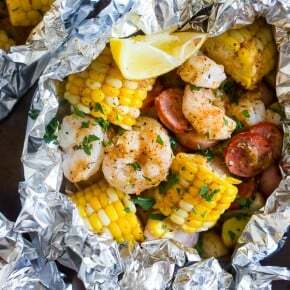 These little low country boil foil packs are filled with all the things you might typically find in a low country boil – shrimp, potatoes, corn on the cob, andouille sausage and a sprinkle (or two!) of Old Bay seasoning. It’s a perfect balance of meat to vegetables all with a zippy Old Bay taste. 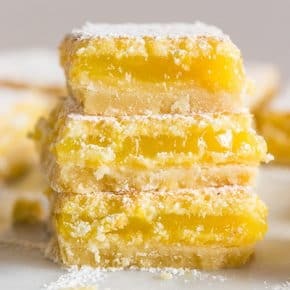 I also like to throw in a wedge of lemon because one can never go wrong with a squeeze of lemon. Of course making these little low country boil foil packets couldn’t be easier. Simply throw all the stuff you need into the foil packet, wrap it up tight and get to cooking! If you have your grill going simply pop it onto the grill or you can do it right in your oven too. 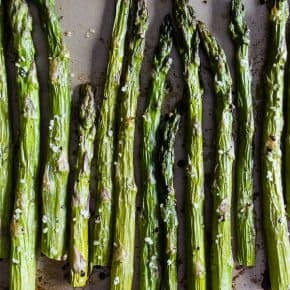 I like to think of the oven option for those time you’re craving summer food in the middle of winter and the grill is covered by 12 feet of snow. Ugh. Winter life on the east coast. 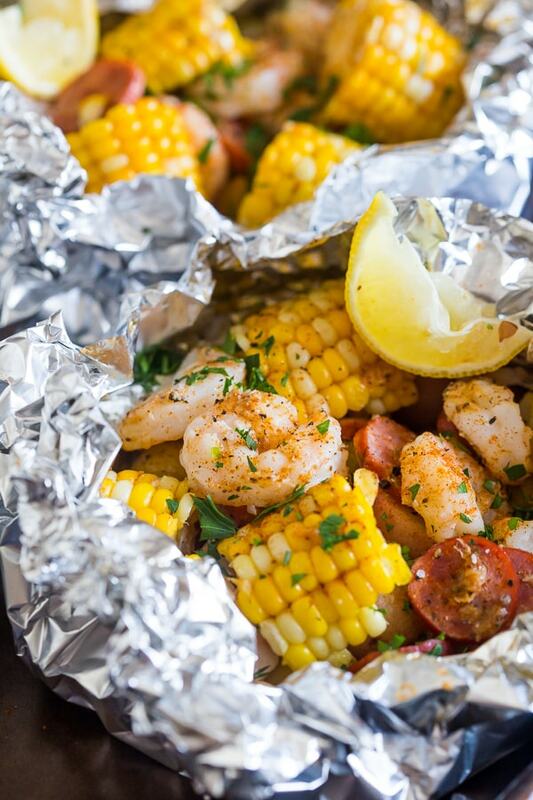 These low country boil foil packets are a breeze to make and packed full of flavor. Potatoes, corn, andouille sausage and shrimp all together in an easy foil packet that you can bake in the oven or throw on the grill. 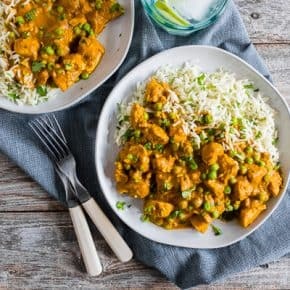 You'll love this flavorful dish! Preheat your grill to high OR preheat your oven to 425 degrees. 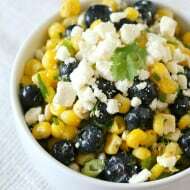 In a large bowl add all ingredients and toss to combine and equally coat in oil and seasoning. Lay out 4 16-inch long pieces of foil and divide the mixture equally and put into the middle of each piece of foil. Wrap up the foil so that there are no holes. If you have super thin foil or there is too much to adequately close the pouch tear off another piece of foil and double wrap your packet. If cooking on the grill add the packets to the grill and cook for about 15 minutes, flipping the packet half way through cooking. Remove one packet and test the potatoes for doneness. If done remove all packets, if not fully cooked add back to the grill until done. If cooking in the oven add your packets to a large baking sheet and cook for about 15-20 minutes at 425 degrees or until everything is fully cooked in the packet. Once cooked sprinkle the contents of the packet with a little fresh parsley and a squeeze of fresh lemon if desired. Notes: Since your potatoes are not pre-cooked you have to cut them small enough to cook in the allotted time. You can also opt to parboil your potatoes before hand if you are worried. You can also feel free to add more spice and Old Bay depending on your love of spiciness and saltiness of foods. I’m also not meant to sleep on the ground but I do like the camping food. This sounds delicious. 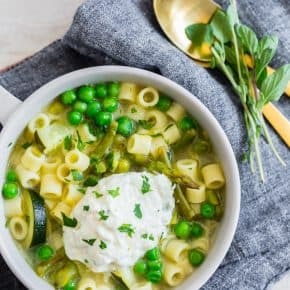 I love the ease of making this meal…and the clean up! I love shrimp boils! I have never tried to do it in a foil packet before, this is wonderful! 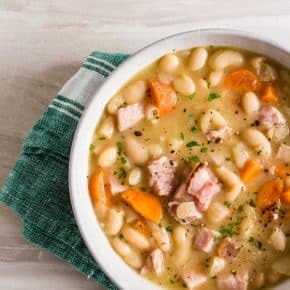 I am so not a camper, but I love easy dinners like this! Haha, I SO feel you about being too old to sleep on the floor! (Same, lol.) Your weird teenage years actually sound pretty fantastic…I mean, how many of us got to sleep in 18 century-style tents?! And yum, these packets look perfect! 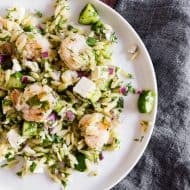 I’m not the biggest fan of shrimp, but everyone else in my family will love this! Oh! and you are so NOT high maintenance. I totally need a bed! These packets are such a great idea. Eating is truly the only “fun” part of camping for me. 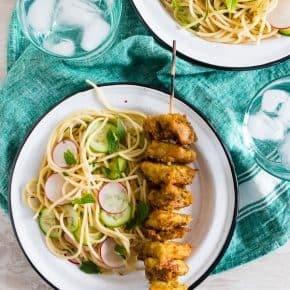 Totally one of our favorite dinner ideas during the summer!! Love shrimp like this!! 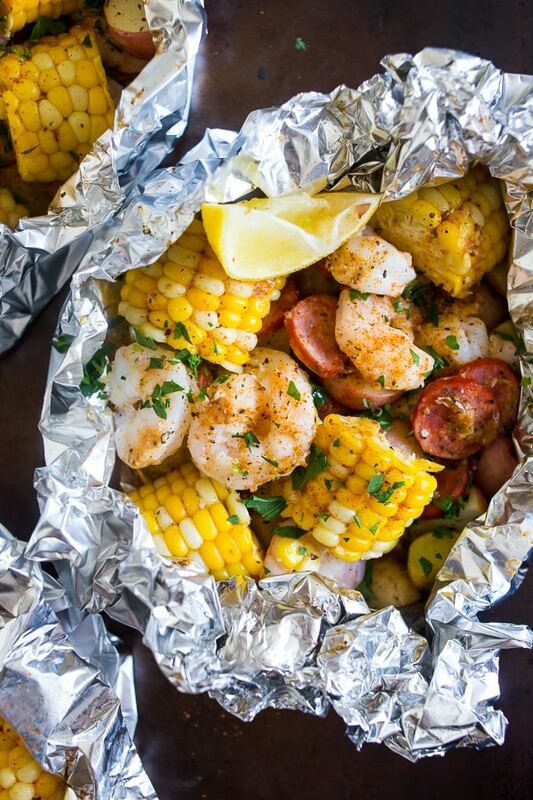 What a brilliant idea to capture all the flavors of a low country boil, in super-easy foil packets! I just love this idea, and the photos are magnificent! I don’t sleep on the ground either… anymore. We bought a camper and it has a full queen bed with a 4″ memory foam topper. It might be more comfortable than my regular bed…. lol! These foil packets look great. I love shrimp in all the things — especially camping (glamping). It feels so fancy! This was so good! Made it tonight but added crab and minced garlic, then freshey chopped basil before serving. Big hit with the family. Thank you!! Hi, Can you please tell me what I can use in place of the “Old Bay Seasoning” as we don’t have that here in Australia. Hubby and I go travelling a LOT in our caravan and this type of meal appeals to me for when we’re venturing around. Thank you. Hi Josephine! Old Bay is a mixture of paprika, salt, pepper, crushed red pepper and celery salt. Hope this helps!